One of the most significant therapy areas for therapeutic antibodies is oncology, with more than 200 antibodies having passed through clinical testing (1). One of the key mechanisms of action for such antibodies is the targeted killing of tumour cells through recruitment of the immune system, which is achieved through interaction of the Fc domain with the complement component C1q or Fcγ receptors. However, many of these antibodies have failed in clinical trials due to insufficient efficacy (2). This has, therefore, lead to efforts to increase the potency of antibodies through enhancement of their ability to mediate cellular cytotoxicity functions such as antibody dependent cell mediated cytotoxicity (ADCC) and antibody dependent cell mediated phagocytosis (ADCP). In particular efforts have focussed on increasing the affinity of the Fc domain for the low affinity receptor FcγIIIa. A number of mutations within the Fc domain have been identified that either directly or indirectly enhance binding of Fc receptors and through this significantly enhance cellular cytotoxicity (2-5). Researchers at Genentech identified the mutations S239D/A330L/I332E (dubbed 3M) (2, 3), MedImmune identified the mutation F243L (4) and Xencor identified G236A (5). Figure. Enhancement of Fc effector functions. Structural representation of a human IgG1 Fc domain in complex with FcγRIII (PDB 1T83). The Fc domain is shown as a ribbon representation in blue, glycosylation in orange and FcγRIII as a transparent space filled model. A selection of the amino acids that have been targeted for enhancing Fc effector functions are shown as red spheres. An alternative approach has focussed on glycosylation of the Fc domain. It is known that FcγRs interact with the carbohydrates on the CH2 domain and that the composition of these glycans has a substantial effect on effector function activity (6). Perhaps the best example of this is afucosylated (non-fucosylated) antibodies, which exhibit greatly enhanced ADCC activity through increased binding to FcγRIIIa (7-10). Activation of ADCC and CDC is often desirable for therapeutic antibodies but there are circumstances in which an antibody unable to activate effector functions is preferential. For these purposes IgG4 has commonly been used but this has fallen out of favour in recent years due the unique ability of this sub-class to undergo Fab-arm exchange, where heavy chains can be swapped between IgG4 in vivo (11, 12). Fc engineering approaches have been used to determine the key interaction sites for the Fc domain with Fcγ receptors and C1q and then mutate these positions to reduce or abolish binding. Through alanine scanning Duncan and Winter first isolated the binding site of C1q to a region covering the hinge and upper CH2 of the Fc domain (13, 14). Researchers at Genmab identified mutants K322A, L234A and L235A, which in combination are sufficient to almost completely abolish FcγR and C1q binding (15). In a similar manner MedImmune later identified a set of three mutations, L234F/L235E/P331S (dubbed TM), which have a very similar effect (16). An alternative approach is modification of the glycosylation on asparagine 297 of the Fc domain, which is known to be required for optimal FcR interaction. A loss of binding to FcRs has been observed in N297 point mutations (3, 17), enzymatically degylcosylated Fc domains (18), recombinantly expressed antibodies in the presence of a glycosylation inhibitor (19) and the expression of Fc domains in bacteria (20, 21). Figure. Abolishing Fc effector function. Structural representation of a human IgG1 Fc domain in complex with FcγRIII (PDB 1T83). The Fc domain is shown as a ribbon representation in blue, glycosylation in orange and FcγRIII as a transparent space filled model. A selection of the amino acids that have been targeted for abolishing interaction with Fc receptors are shown as red spheres. IgG naturally persists for a prolonged period in the serum due to FcRn-mediated recycling, giving it a typical half-life of approximately 21 days. Despite this there have been a number of efforts to engineer the pH dependant interaction of the Fc domain with FcRn to increase affinity at pH 6.0 while retaining minimal binding at pH 7.4. Researchers at PDL BioPharma identified the mutations T250Q/M428L, which resulted in an approximate 2-fold increase in IgG half-life in rhesus monkeys (22), and researchers at MedImmune have identified mutations M252Y/S254T/T256E (dubbed YTE), which resulted in an approximate 4-fold increase in IgG half-life in cynomolgus monkeys (23, 24). Whilst these enhancements are yet to be shown in humans it is hoped that significant increases to half-life will bring about the possibility of decreasing administration frequency whilst maintaining or improving efficacy. Model of a human IgG1 Fc domain in complex with FcRn. The Fc domain is shown as a ribbon representation in blue, glycosylation in orange and the FcRn-B2M heterodimer as a transparent space filled model. A selection of the amino acids that have been targeted for enhancing pH dependant interaction with FcRn are shown as red spheres. Model produced from PDB accession numbers 1H3U and 1I1A. Reichert, J.M., and Valge-Archer, V.E. (2007). Development trends for monoclonal antibody cancer therapeutics. Nat Rev Drug Discov 6, 349–356. Lazar, G.A., Dang, W., Karki, S., Vafa, O., Peng, J.S., Hyun, L., Chan, C., Chung, H.S., Eivazi, A., Yoder, S.C., et al. (2006). Engineered antibody Fc variants with enhanced effector function. PNAS 103, 4005–4010. Shields, R.L., Namenuk, A.K., Hong, K., Meng, Y.G., Rae, J., Briggs, J., Xie, D., Lai, J., Stadlen, A., Li, B., et al. (2001). High Resolution Mapping of the Binding Site on Human IgG1 for FcγRI, FcγRII, FcγRIII, and FcRn and Design of IgG1 Variants with Improved Binding to the FcγR. J. Biol. Chem. 276, 6591–6604. Stewart, R., Thom, G., Levens, M., Güler-Gane, G., Holgate, R., Rudd, P.M., Webster, C., Jermutus, L., and Lund, J. (2011). A variant human IgG1-Fc mediates improved ADCC. Protein Engineering, Design and Selection 24, 671–678. Richards, J.O., Karki, S., Lazar, G.A., Chen, H., Dang, W., and Desjarlais, J.R. (2008). Optimization of antibody binding to FcγRIIa enhances macrophage phagocytosis of tumor cells. Mol Cancer Ther 7, 2517–2527. Jefferis, R. (2009). Glycosylation of antibody therapeutics: optimisation for purpose. Methods Mol. Biol. 483, 223–238. Niwa, R., Hatanaka, S., Shoji-Hosaka, E., Sakurada, M., Kobayashi, Y., Uehara, A., Yokoi, H., Nakamura, K., and Shitara, K. (2004). Enhancement of the antibody-dependent cellular cytotoxicity of low-fucose IgG1 Is independent of FcgammaRIIIa functional polymorphism. Clin. Cancer Res. 10, 6248–6255. Okazaki, A., Shoji-Hosaka, E., Nakamura, K., Wakitani, M., Uchida, K., Kakita, S., Tsumoto, K., Kumagai, I., and Shitara, K. (2004). Fucose depletion from human IgG1 oligosaccharide enhances binding enthalpy and association rate between IgG1 and FcgammaRIIIa. J. Mol. Biol. 336, 1239–1249. Ferrara, C., Stuart, F., Sondermann, P., Brünker, P., and Umaña, P. (2006). The carbohydrate at FcgammaRIIIa Asn-162. An element required for high affinity binding to non-fucosylated IgG glycoforms. J. Biol. Chem. 281, 5032–5036. Yamane-Ohnuki, N., and Satoh, M. (2009). Production of therapeutic antibodies with controlled fucosylation. MAbs 1, 230–236. Van der Neut Kolfschoten, M., Schuurman, J., Losen, M., Bleeker, W.K., Martinez-Martinez, P., Vermeulen, E., den Bleker, T.H., Wiegman, L., Vink, T., Aarden, L.A., et al. (2007). Anti-inflammatory activity of human IgG4 antibodies by dynamic Fab arm exchange. Science 317, 1554–1557. Labrijn, A.F., Buijsse, A.O., van den Bremer, E.T., Verwilligen, A.Y., Bleeker, W.K., Thorpe, S.J., Killestein, J., Polman, C.H., Aalberse, R.C., Schuurman, J., et al. (2009). Therapeutic IgG4 antibodies engage in Fab-arm exchange with endogenous human IgG4 in vivo. Nature Biotechnology 27, 767–771. Duncan, A.R., and Winter, G. (1988). The binding site for C1q on IgG. Nature 332, 738–740. Duncan, A.R., Woof, J.M., Partridge, L.J., Burton, D.R., and Winter, G. (1988). 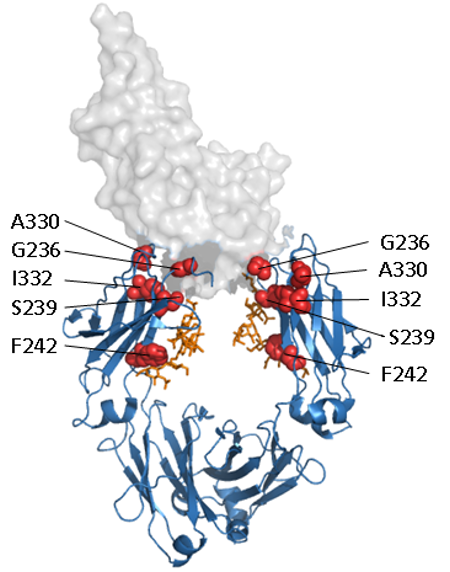 Localization of the binding site for the human high-affinity Fc receptor on IgG. Nature 332, 563–564. Hezareh, M., Hessell, A.J., Jensen, R.C., van de Winkel, J.G.J., and Parren, P.W.H.I. (2001). Effector Function Activities of a Panel of Mutants of a Broadly Neutralizing Antibody against Human Immunodeficiency Virus Type 1. J Virol 75, 12161–12168. Oganesyan, V., Gao, C., Shirinian, L., Wu, H., and Dall’Acqua, W.F. (2008). 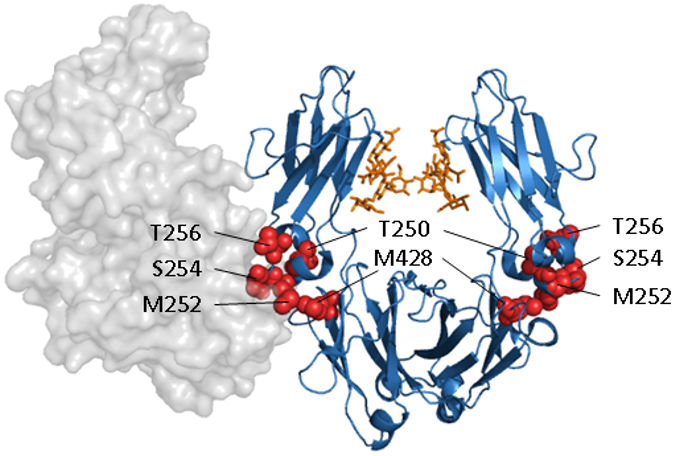 Structural characterization of a human Fc fragment engineered for lack of effector functions. Acta Crystallographica 64, 700–704. Tao, M.H., and Morrison, S.L. (1989). Studies of aglycosylated chimeric mouse-human IgG. Role of carbohydrate in the structure and effector functions mediated by the human IgG constant region. J. Immunol. 143, 2595–2601. Mimura, Y., Sondermann, P., Ghirlando, R., Lund, J., Young, S.P., Goodall, M., and Jefferis, R. (2001). Role of oligosaccharide residues of IgG1-Fc in Fc gamma RIIb binding. J. Biol. Chem. 276, 45539–45547. Walker, M.R., Lund, J., Thompson, K.M., and Jefferis, R. (1989). Aglycosylation of human IgG1 and IgG3 monoclonal antibodies can eliminate recognition by human cells expressing Fc gamma RI and/or Fc gamma RII receptors. Biochem. J. 259, 347–353. Mazor, Y., Van Blarcom, T., Mabry, R., Iverson, B.L., and Georgiou, G. (2007). Isolation of engineered, full-length antibodies from libraries expressed in Escherichia coli. Nat. Biotechnol. 25, 563–565. Simmons, L.C., Reilly, D., Klimowski, L., Raju, T.S., Meng, G., Sims, P., Hong, K., Shields, R.L., Damico, L.A., Rancatore, P., et al. (2002). Expression of full-length immunoglobulins in Escherichia coli: rapid and efficient production of aglycosylated antibodies. J. Immunol. Methods 263, 133–147. Hinton, P.R., Johlfs, M.G., Xiong, J.M., Hanestad, K., Ong, K.C., Bullock, C., Keller, S., Tang, M.T., Tso, J.Y., Vásquez, M., et al. (2004). Engineered Human IgG Antibodies with Longer Serum Half-lives in Primates. J. Biol. Chem. 279, 6213–6216. Dall’Acqua, W.F., Woods, R.M., Ward, E.S., Palaszynski, S.R., Patel, N.K., Brewah, Y.A., Wu, H., Kiener, P.A., and Langermann, S. (2002). Increasing the affinity of a human IgG1 for the neonatal Fc receptor: biological consequences. J Immunol 169, 5171–5180. Dall’Acqua, W.F., Kiener, P.A., and Wu, H. (2006). 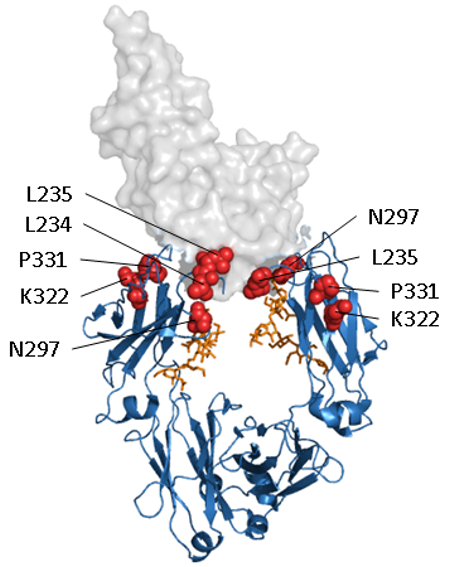 Properties of human IgG1s engineered for enhanced binding to the neonatal Fc receptor (FcRn). The Journal of Biological Chemistry 281, 23514–23524.